A couple of weeks ago, I had the chance to visit Dinant in Belgium. 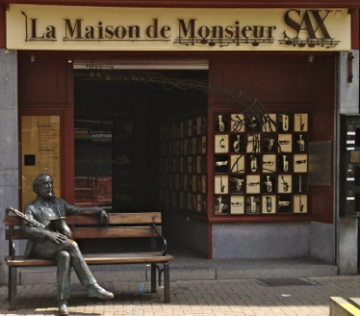 Dinant is the birthplace of Adolphe Sax, the inventor of the whole saxophone family (among many other musical things), and has a street, a square, a museum and lots of sculpture dedicated to the great man, so I packed my bags and off I went. Dinant is a lovely town and I highly recommend it as a place to visit whether you are a saxophile or not. (I’m told that the town bridge isn’t always haunted by mysterious English women playing the chalumeau!) Apparently it’s the two-hundredth anniversary of M. Sax’s birth in 2014. I suspect there will be a bit of a party, with much discussion of reeds and mouthpieces, and possibly the consumption of a litre or two of the splendid local beverages…. Talking of parties, here’s a last shameless plug for our octet concert in Buxton on July 19th. Advance tickets are now available via the Buxton Opera House web-site.